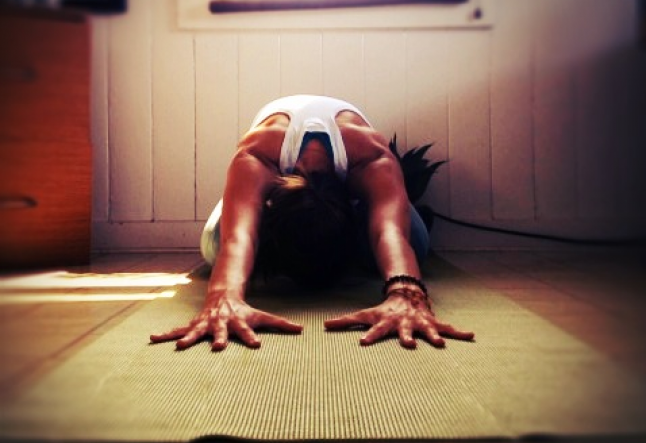 Being a yogi is stimulating yet calming, fun yet challenging, testing yet rewarding. It is forgiving yet a responsibility, understanding while pushing your buttons, loving while stirring up all sorts of emotions. It is an art of how one creates their life. At the end of the day, when you clear the space, it leaves you there looking yourself in the eye. Nothing could be more true than the quote we sometimes hear: "You are your own worst enemy." Somehow, through the difficulties of that statement, there is a comforting feeling in knowing that if we begin to purify our selves that the world will magically become pure. A yoga teacher of mine once told me about magic. In his own way, teaching me about the philosophy of the magic in the shift of perception. He made me realize that it is not "new age" nor "out there" to see that it is all within ourselves. The world is just a projection of our own minds. It's not always easy to believe this since we are conditioned to identify with certain things: categorizing the good and the bad, comparing, reducing to formulas, trying to make rights and wrongs absolute. At the end of the day, everyone holds a different measuring stick with different variables and conditions. I try to keep an open mind by receiving teachings from everywhere, even in different religions, seeing that there are similar lessons being taught with different words. It is scary to have a large grey area. It's much more comforting to have a definitive answer but that is not how we are created and to subject ourselves to "black or white", "this or that" is an illusion. This may leave us in the "yogi's confusion", as I'd like to call it. The place where people get lost and maybe frustrated and question how it possible to live in a world where all these teachings can be applied. So, next time this doubt arises, look yourself in the eye and ask yourself if you're making it seem impossible because it's too scary to try. Observe what may be under those thoughts that point to the exit. One day I had to face myself with a question. I was torn between choosing two events. All the way until the morning of, I was still torn. Somehow something within me directed me towards a choice. Somehow the universe was showing me that this choice was in line with my dharma. All the obstacles that I created in my head for why I should've chosen the other choice were not present. When I finally made the decision, everything fell into place. I arrived. I cried as I listened to stories about those who survived and passed due to cancer. I felt connected as we rang the bell for either being or knowing someone who is/had battling/battled cancer. I understood so deeply the quote "no one benefits from saving the body if in the process the soul is destroyed". I believed every word. I practiced. I smiled. And I eventually laid there in Savasana in the middle of Union Square of San Francisco (what some would imagine to be the least calming place) and I found myself at peace. I confess that my yoga nidra had turned into nidra at some point but I felt a moment of surrender and got up knowing that whenever you are led towards your dharma that it feels so right. I knew that thanks to Yoga for Hope event, I left there with more teachings than any other time I'd been at Union Square.